1978 or ’79 | age 10 or 11 Cor… hundreds of Imperial Star Destroyers! But what good are Snub-Fighters going to be against them? “What happened to the Death Star—we heard nothing about it.” Then how did you know to ask? Originally it read , “We heard anything about it.” What, like: The Death Star’s disappeared, the Death Star’s a giant beach ball, the Death Star’s in my granny’s garage? Wow, when you can hear anything about a thing, the possibilities of what you might hear are literally unlimited! Those troopers must have been baffled. In fact, their concept of reality was probably completely disintegrating. Lucky they found Vader, so he can set the story straight. I’m constantly amazed at how I dropped letters here and there, or misspelled things. I was actually quite a good speller for my age—and a very good one later on. 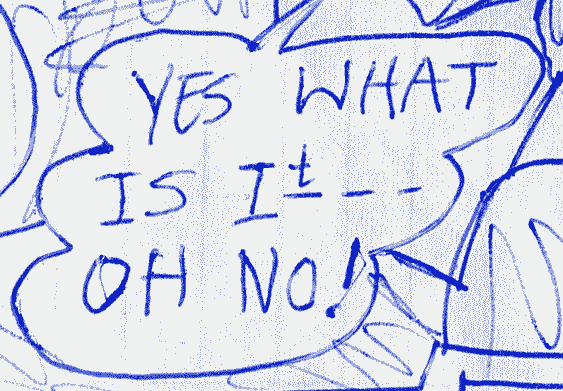 I think I was just in such a rush to get to doing the drawings that I was slap-dash about the lettering. I did pause for an interestingly creative bit of typography though. Check out Leia’s “It–“ below. Very unusual! Above: SPELLING! And it looks like I was still still doing ‘diamond-shaped‘ eyes at this point of my development. So most likely from 1978. I did wonder if the Rebels were a bit silly not to evacuate their Yavin 4 base immediately—as the Imperials by then knew all about it. On the one hand, it looks as if this is all happening within minutes of the Death Star’s destruction. And the Star Destroyers wasted no time getting to Yavin 4, to wreak some destruction of their own. If so, when did the <Throne Room medal ceremony happen? Did our heroes get cleaned-up, wardrobe-changed, hair-styled, repaired and polished, and medal-awarded in 15 minutes—and then rush out to defend against this attack? Or on the other hand, was Vader tumbling through space for days, and the rebels actually did party and waste time until the Star Destroyers arrived? Who knows! No matter, the rebels are fighting back now—drunk or sober. The X-Wings zip into action. Luckily, it seems that they still have plenty of X-Wings left after the attack on the Death Star. I wonder why they didn’t use all of them in that attack? I mean, what did they have to lose? If the attack failed, they’d all be destroyed anyway. Maybe they forgot they had some extra ones lying around in a back hangar. Yay—it’s Luke. At least, I assume that it is. That’s a mean looking clenched-teeth expression on his face. 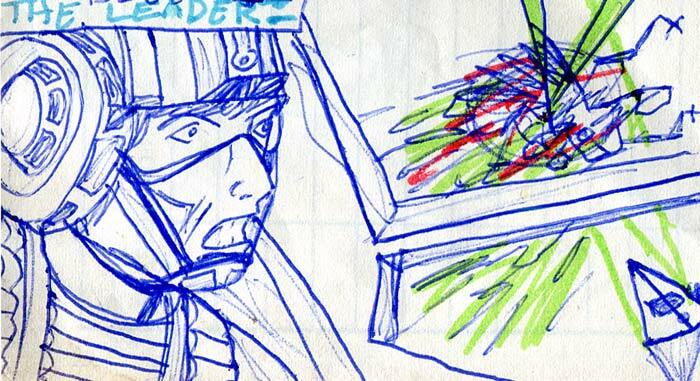 It reminds me of how the evil Nazi characters were sometimes drawn in Warlord comic. Especially the SS ones. Seems a bit weird to see it on good-guy Luke. But then, I suppose he’s very angry to see his fellow warriors being killed. It appears he’s now become Blue 1/Blue—either for his gallantry—or by default, after most of the best pilots were wiped out over the Death Star. So you’ve basically got Luke and Wedge—and a bunch of hastily trained janitors and catering staff flying what’s left of the X-Wings! The Imperials are trying a new tactic in their clean-up of Rebel Scum. They simply turn on their Tractor Beams full blast and hoover up the X-Wings! Brilliant! 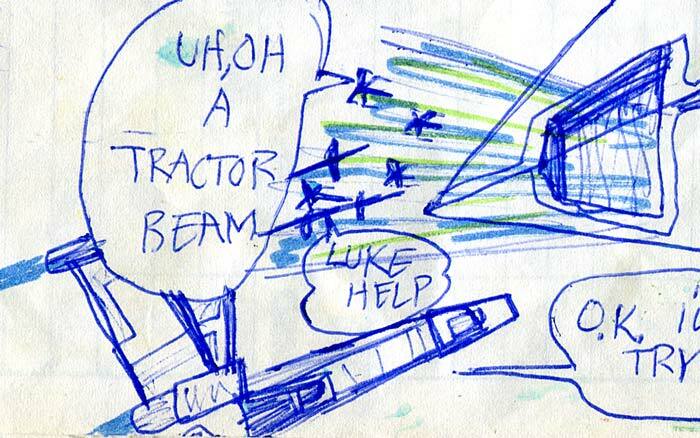 ‘ALIENS’ had its shake and bake operation, maybe this is Star Wars’ Shake and Vac? “It’s all you have to do…” Find out what happens next: this wednesday! I’m happy with today’s page. It’s made me smile! How about you? We would be honored if you would join us… and leave a comment below. I read them all! I really think this should be published as a book – the commentary is so interesting. 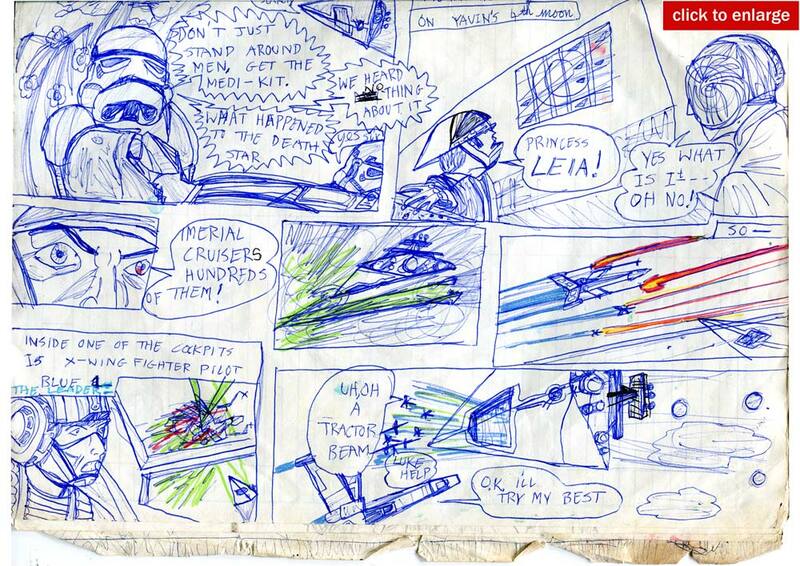 I’ve always loved the idea of publishing the main ‘Star Wars’ comic. I think, but am not certain, that it’d either have to be done with LucasFilm’s permission—and they’d get a cut (of what?) AND/OR published on a non-profit/covering-my-costs basis. I’ve never seriously looked into it. Given the very low traffic that this free and very accessible website version gets, I’m not sure there’d be a market for a book version that’d cost actual money. Also, There are around 185 pages of the comic itself which’d be printed in colour—very expensive! And if I added the commentary—which I think it needs—that would at least double the page count. So it’d be a monster c.400 page book—in colour. Expensive to make and purchase I’d imagine. If I did do it, I’d want to send complimentary copies to Mark Hamill—who seemed to like it—and other other SW peeps.